Under German competition law, unilateral conduct by an enterprise with market power is governed by Sections 18, 19 and 20 of the German Act against Restraints of Competition (ARC),2 which prohibit the abuse of a (single or collective) dominant position, and specific types of abusive behaviour by enterprises that have ‘relative’ market power in relation to small or medium-sized enterprises (as trading partners or competitors). Germany has thus used the possibility provided for under EU Regulation 1/2003 to enact national legislation on unilateral conduct that goes beyond the substance of the prohibition on the abuse of a dominant position laid down in Article 102 of the TFEU. Another distinct characteristic of German antitrust law on dominance is that there are (rebuttable) statutory market share-based presumptions of dominance. Guidance on the application of the rules can be gathered from the case law of the German Federal Cartel Office (FCO) and the German courts, notably the Federal Court. There is no formal general guidance on unilateral conduct available, apart from the FCO’s somewhat dated notice on below-cost pricing3 (which has been under review by the FCO for years now). No special rules apply in Germany to the public sector or state-owned enterprises. Section 130(1) of the ARC stipulates that the ARC will also apply to enterprises that are entirely or partially publicly owned or are managed or operated by public authorities. Special rules apply to certain regulated industries, such as electricity, gas, telecommunications and post and railway. The Federal Network Agency monitors compliance with certain of these regulations in cooperation with the FCO. * The FCO did not issue a settlement decision, but dropped its proceedings after Deutsche Milchkontor eG changed its supply conditions in reaction to the FCO’s investigation. See FCO press release of 9 January 2018, available in English at https://www.bundeskartellamt.de/SharedDocs/Meldung/EN/Pressemitteilungen/2018/09_01_2018_Milch_Einstellung.html;jsessionid=21AEFEAD79B80B351D5BF508C17C14D2.2_cid362?nn=3591568. † The FCO investigated the DFB for abusing its dominant position regarding the allocation of the German ticket quota for the 2018 soccer world cup because the DFB intended to sell tickets only to its own members who had to pay an annual membership fee of €40. While the FCO considered that this behaviour could be justified, at least in part, by security considerations (effectively preventing ticket sales to known hooligans), the DFB nonetheless committed to introduce a short-time membership at a reduced fee. Against this background, the FCO dropped its investigation. * The FCO did not issue a settlement decision, but dropped its proceedings after Deutsche Funkturm changed its allegedly problematic pricing and contractual terms. See FCO press release of 21 December, 2016, available in German only at www.bundeskartellamt.de/SharedDocs/Meldung/EN/Pressemitteilungen/2016/21_12_2016_Deutsche%20Funkturm.html?nn=3591568. In addition to the FCO’s enforcement activities, the German legislator recently passed a ninth amendment to the ARC (Ninth ARC Amendment), which entered into force on 9 June 2017. The amendment includes – among other substantive changes to the ARC, in particular regarding the enforcement of cartel damage claims (as required by the EU Damages Directive)18 – some changes and additions regarding the ARC sections governing unilateral conduct. These largely editorial changes mostly seek to clarify unsettled legal questions, but also implement previous case law. For instance, the amendment introduced new rules regarding the assessment of dominance on multisided markets and dominant purchasers. Some of these legislative changes are described in the following sections along with further important case law and other developments. 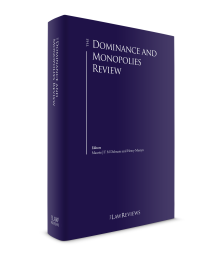 There are two slightly different concepts of market power in German antitrust law. While the assessment of ‘absolute’ single or collective dominance typically requires a detailed market analysis (of market definition as well as of market power), the assessment of ‘relative’ market power focuses more on a comparison of market power between larger and small and medium-sized companies as trading partners or competitors. Generally, the FCO and the German courts continue to place considerable importance on market shares and have only slowly started to adopt the more sophisticated economic analyses used by the EU Commission. In practice, ex post behavioural enforcement tends to take a somewhat narrower view on market definition than merger control, given that the perspective of specific customers or competitors potentially harmed by the conduct at issue can sometimes influence the assessment. As previously noted, German antitrust rules on unilateral conduct apply to companies in a position of single or joint dominance, and to companies enjoying ‘relative’ market power over small and medium-sized companies. Section 18 of the ARC defines single and collective dominance. the ability of the enterprise’s customers or suppliers to switch to other enterprises. In practice, the FCO and the German courts tend to focus on whether an enterprise has sufficient market power to determine the most important business parameters. A somewhat static appraisal of market shares (both in absolute and relative – compared to competitors – terms) is still the most important factor. The rebuttable market share-based presumption pursuant to Section 18(4) of the ARC provides an important first indication of possible dominance where the market share of a company exceeds 40 per cent.24 While not impossible, it is often difficult in practice to rebut the presumption with economic arguments, especially in the case of high market shares substantially above the presumption threshold. This is notably because German law expressly stipulates that a dominant position can be based on a ‘superior’ market position, even if the company concerned faces significant competition from its rivals. Section 18(6) of the ARC also provides for market share-based legal presumptions for collective dominance. Thus, three or fewer companies are presumed to be collectively dominant if they have a market share of at least 50 per cent; and five or fewer companies are presumed to be collectively dominant if they have a market share of at least two-thirds. These presumptions are rebuttable, and the companies can show that substantial competition exists between them individually or that they are jointly sufficiently constrained by outsiders or customers. Section 19(1) of the ARC contains a general prohibition of the abuse of a dominant position. Sections 19 and 20 of the ARC contain non-exhaustive examples of specific types of abusive conduct. Section 20(2) of the ARC extends the prohibition of exclusionary and discriminatory conduct to companies on which small or medium-sized companies depend, and Section 20(3) of the ARC prohibits exclusionary conduct by companies that enjoy superior market power compared with their small and medium-sized competitors. The most significant specific types of abuse are discussed below (see Section IV, ii to iv). There are no per se abuses, as all relevant unilateral conduct may, at least in principle, be justified by means of a comprehensive analysis of all relevant circumstances and a balancing of the conflicting interests. As a practical matter, however, once the FCO has concluded that the type of conduct at issue is generally abusive, it will not conduct an in-depth economic effects analysis. Instead, it is – according to Section 20(4) of the ARC – up to the companies concerned to demonstrate an objective justification for their conduct (e.g., cost efficiencies as justification for rebates). Another form of exclusionary abuse is exclusive dealing, including strategies such as exclusivity or loyalty rebates. As a general rule, dominant companies may not grant rebates that create an incentive for customers to purchase their entire, or almost-entire, demand for the products or services at issue from the dominant enterprise. German antitrust law also prohibits leveraging a dominant position, such as through contractual or economic tying and bundling. Case law is scarce here, and the German practice is similar to the EU practice. Section 19(2) No. 1 of the ARC prohibits discrimination (i.e., treating an undertaking, directly or indirectly, differently from other similar undertakings without any objective justification). After the German legislator introduced an ancillary copyright for news publishers in 2013, the collecting society VG Media (representing several German news publishers) adopted a new tariff for the use of news publishers’ online content and raised monetary claims against Google for the display by Google of small text excerpts (‘snippets’) from their websites. Google refused to pay, and announced it would discontinue the display of snippets from VG Media members unless they agreed to the display of their snippets without payment. VG Media filed a complaint with the FCO, arguing that Google abused its allegedly dominant position by refusing to pay for the display of snippets. The FCO informally rejected the complaint in August 2014,46 and issued a formal rejection decision in September 201547 holding that Google did not engage in discriminatory conduct. In particular, the FCO considered Google’s conduct justified by its interest to preserve its business model and to reduce the risk of liability for damages. These interests would outweigh those of VG Media. In another recent abuse case concerning the food retailer EDEKA, the FCO found that EDEKA had abused its dominant position (according to Section 19(2) No. 5 ARC) by urging its suppliers to grant EDEKA certain commercial benefits (sometimes called ‘wedding rebates’) after its acquisition of retailer PLUS.50 While the Düsseldorf Court of Appeal considered the rebates to have resulted from negotiations between parties with approximately equal negotiation power,51 the Federal Court reinstated key aspects of the FCO’s decision, and found that Edeka’s retroactive ‘cherry picking’ of rebates granted to itself or PLUS was abusive. Since the Ninth ARC Amendment abolished the previously required causal link between the grant of the advantage and the exploitation of a dominant position from Section 19(2) No. 5 ARC, the FCO should find it easier to establish an abuse by a dominant purchaser. In this respect, the FCO already intervened against furniture retailer XXXLutz for requesting unjustified wedding rebates (XXXLutz asked suppliers to retroactively grant discounts to purchases that Möbel Buhl had made before it had been acquired by XXXLutz) from its suppliers. The FCO did not launch a formal investigation, but closed the file after XXXLutz committed to stop demanding such rebates. Persons or entities that participated in an infringement of antitrust law or violated an FCO decision can be fined within the framework of an administrative offence procedure. German antitrust law is different from EU law in this respect, insofar as the FCO in principle needs to identify one or more individuals (who will likely also be fined, albeit more moderate amounts) who have committed the infringement and then attribute their behaviour to the legal entity they represented in order to also impose a fine on that entity. According to Section 30(2a) of the Administrative Offences Act, legal successor entities (i.e., entities resulting from corporate transformations) are liable for their predecessor’s fines. This regulation was introduced in 2013 to close an important enforcement gap under the previous rules.55 In addition, the German legislator has also now introduced a provision regarding legal successor liability (outside of the universal succession addressed by the Administrative Offences Act) in the ARC in order to close the ‘sausage gap’.56 According to the newly introduced Section 81a (covering the singular succession), cartel fines may be imposed on an enterprise taking over the business of an enterprise that committed an infringement (provided that the infringing enterprise has ceased to exist (legally or economically) and the purchaser continued the business). According to the current guidelines, the 10 per cent maximum for a fine on a company should not be considered a cap limiting a fine calculated independently of the relevant company’s turnover that could otherwise be higher (as is the case under EU law), but rather the upper limit of the fining scale, which should, thus, be applied only in cases of the most extreme hard-core infringements. Pursuant to the fining guidelines, the FCO first determines the basic amount of the fine, which is 10 per cent of the group’s relevant turnover achieved with the products or services related to the infringement for the period during which the infringement was ongoing. In a second step, this initial amount is multiplied depending on the size of the group by a factor between two and six, or even higher in cases where the group’s turnover exceeds €100 billion. The resulting basic amount may then be adjusted in a third step for mitigating or aggravating circumstances. German administrative offence law allows the FCO also to collect proceeds derived from an infringement, either in separate administrative proceedings or by determining a fine that reflects such proceeds (in which case the total fine may exceed the 10 per cent maximum). Sections 32 to 34 of the ARC allow for behavioural remedies. Thus, the FCO may impose all measures necessary to bring an infringement effectively to an end and that are proportionate to the infringement. This includes the right to impose measures that require action by the infringer. Section 32a of the ARC allows the FCO to impose interim measures in cases of urgency if there is a risk of serious and irreparable damage to competition. Such measures should, however, not last longer than one year. Section 32(2) of the ARC provides for the possibility of structural remedies, including divestitures (unbundling) of companies; however, structural remedies are subject to a strict proportionality test and may only be applied where behavioural remedies would be insufficient to remedy the infringement. To date, the FCO has not imposed any structural remedies in abuse cases. In administrative proceedings, the FCO carries out investigations to decide whether to issue a prohibition decision and, if appropriate, a fine. Such decisions can be taken simultaneously or consecutively, and both are subject to judicial review of the facts and the law by the Düsseldorf Court of Appeal. The Court’s decisions can be further appealed – on points of law only – to the Federal Court. In practice, the courts indeed carry out an independent review of the cases brought before them. While they often side with the FCO, it is by no means rare that FCO decisions are overturned based on factual or legal errors of the FCO. The FCO may commence investigations ex officio or, and in practice more frequently, following complaints of third parties (e.g., competitors, customers or suppliers).67 The FCO may carry out informal discussions or send informal questionnaires. It can also take formal measures such as making information requests or, subject to a prior court order, conducting surprise inspections (dawn raids) in the course of which it can seize documents and electronic files. During all stages of an investigation, the enterprises investigated have the right to be heard. The FCO will usually serve a statement of objections before it issues a decision to which the company concerned may respond. The party concerned also has the right of access to the file, including digitally stored data and media. There is no formal procedure for obtaining guidance on individual cases, but the FCO is open to informal contacts and may provide informal guidance in this context. The FCO often ends proceedings by adopting commitment decisions, that is, by declaring remedies offered by the party concerned as binding.68 In light of the increasing importance of such settlements in German antitrust proceedings over the past few years, the FCO published a guidance paper on its settlement practice on 23 December 2013.69 Settlements have frequently been reached in hard-core cartel and vertical restraints cases (resale price maintenance, online impediments). In its guidance paper, the FCO notes that there is no regulatory framework for settlements, but that its power to conclude settlements derives from its discretion to pursue cases. A party to an investigation has no right to a settlement, but can of course suggest it to the FCO. A settlement does not require parties to commit not to appeal any fining decision included in the settlement; however, there are no cases where an enterprise would have actually appealed an administrative fine on which it had previously settled. Cooperation between the FCO, the other national competition authorities and the European Commission takes place via the European Competition Network (ECN). This cooperation may involve exchanging information about cases and decisions, exchanging evidence and mutually assisting each other with investigations. For example, the FCO and ECN jointly published a monitoring report on developments in the German electricity and gas markets in 2015. The FCO has set up an internal coordination unit to represent the authority within the ECN. The FCO is also an active member of the International Competition Network (ICN), and the FCO’s President has chaired the ICN’s Steering Group since 2013. Section 33 of the ARC provides an express legal basis for damage claims based on infringements of antitrust law. Following a significant increase in cartel-related follow-on damage litigation over recent years, damage actions or other types of litigation (e.g., requesting the termination of discriminatory conduct, access to a network or infrastructure) based on alleged restrictive unilateral conduct have also become fairly frequent. Unlike cartel damage cases, these actions often do not follow an investigation and decision by the FCO (or other competition authorities), but are brought on a stand-alone basis. In addition, consumer associations may bring actions on behalf of consumers, but only for injunctions, not for damages. Where a company has derived benefits from abusive or predatory conduct, the FCO, or, if the FCO has not done so, consumer associations, may in principle seek to collect such benefits on behalf of the state (private damage claims and fines imposed by the FCO already reducing such benefits are taken into account). In practice, however, such actions are very rare. Interestingly, the German legislator has also expanded the FCO’s competences in the area of consumer protection. The FCO may now in particular conduct sector inquiries if there is evidence of sustained, significant and repeated violations against consumer protection law in an industry (Section 32e(5) ARC). On that basis, the FCO has already launched its first sector inquiry focusing on the conduct of price comparison websites in the area of travel, insurance, financial services, telecommunications and energy.76 In addition, the FCO can now act as amicus curiae in court proceedings that concern such violations (Section 90(6) ARC). The Monopolies Commission recently repeated that it sees competitive deficits in the railway transportation, postal services and energy sectors. While the Monopoly Commission does not have enforcement or legislative powers, the FCO and the legislator take its view into account in their enforcement and legislative strategy and practice. 1 Stephan Barthelmess is a senior counsel, Tilman Kuhn is a counsel and Tobias Rump is an associate at Cleary Gottlieb Steen & Hamilton LLP. The authors express their gratitude to stagiaire Laura Arnolds for her assistance in updating this chapter. 3 The old version of the notice is available in German at www.bundeskartellamt.de/SharedDocs/Publikation/DE/Bekanntmachungen/Bekanntmachung%20-%20Angebot%20unter%20Einstandspreis.pdf?__blob=publicationFile&v=2. 4 An English version of the guidelines is available at www.bundeskartellamt.de/SharedDocs/Publikation/EN/Leitlinien/Guidelines%20for%20the%20setting%20of%20fines.pdf?__blob=publicationFile&v=3. 7 Most online cases were dealt with under Article 101 of the TFEU and its German equivalent Section 1 of the ARC (prohibiting anticompetitive agreements). However, in the HRS hotel portal case, the FCO held that a best-price clause requested by HRS from hotels listed on its platform also violated Sections 19 and 20 of the ARC (abuse of dominance). Given the violation of Article 101 of the TFEU and Section 1 of the ARC, the Düsseldorf Court of Appeal ultimately left open whether the best-price clause also infringed Sections 19 and 20 ARC (judgment of 9 January 2015, case VI – Kart 1/14 (V)). 8 According to the FCO’s preliminary assessment, Facebook’s terms of service violate data protection law as they allow Facebook to collect user data from third-party sources. Given Facebook’s perceived dominant position on the German market for social networks, this illicit use of contractual provisions in relation to its users might also constitute an exploitative abuse of terms and conditions under antitrust law (see the FCO’s background paper of 19 December 2017, available at https://www.bundeskartellamt.de/SharedDocs/Publikation/DE/Diskussions_Hintergrundpapier/Hintergrundpapier_Facebook.pdf?__blob=publicationFile&v=5 ). 10 Arguably, this process limits the defence rights of companies subject to the subsequent antitrust proceedings, as they are obliged to respond to the sector inquiry without knowing the specific allegations that will be brought against them later on. 19 For example, FCO, decision of 12 December 2003, case B9-60211-Fa-91/03 – ÖPNV-Hannover; decision of 2 July 2008, case B2-359/07 – Loose/Poelmeyer; Federal Court, decision of 4 March 2008, case KVR 21/07 – Soda-Club II. 20 For example, Federal Court, decision of 16 January 2007, case KVR 12/06 – National Geographic II. Specifically with respect to retail markets, the usual product range of a retailer may constitute a single market (‘portfolio market’). 21 Federal Court, decision of 5 October 2004, case KVR 14/03 – Melitta/Schultink. 22 See newly introduced Section 18(2a) ARC. 23 FCO, Guidance on Substantive Merger Control of 29 March 2012, paragraph 9. In its guidelines, the FCO refers to Federal Court, decision of 12 December 1978, case KVR 6/77 – Erdgas Schwaben, and ECJ, decision of 14 February 1978, case 27/76 – United Brands. An English version of the guidelines is available at www.bundeskartellamt.de/SharedDocs/Publikation/EN/Leitlinien/Guidance%20-%20Substantive%20Merger%20Control.pdf?__blob=publicationFile&v=6. 24 Dominance may also (exceptionally) be found to exist if the market share remains below the presumption threshold. 26 FCO, Guidance on Substantive Merger Control of 29 March 2012, paragraph 81. 27 Case T-342/99, 6 June 2002,  ECR II-2585. 28 For example, Federal Court, decision of 11 November 2008, case KVR 60/07 – E.ON/Stadtwerke Eschwege; decision of 20 April 2010, case KVR 1/09 – Phonak/GN Store. 29 In contrast, collective dominant positions were held to exist in several merger control cases. 30 Stuttgart Court of Appeals, judgment of 21 November 2013, case 2 U 46/13. 31 Stuttgart District Court, judgment of 20 March 2013, case 11 O 215/12. 32 The term ‘superior market position’ is part of the legal definition of dominance pursuant to Section 18 of the ARC and must not be confused with the term ‘stronger market power’ pursuant to Section 20 of the ARC (see below). 33 Federal Court, judgment of 16 June 2015, case KZR 83/13, paragraph 46; see also judgment of 16 June 2015, case KZR 3/14, paragraph 45. 34 Section 20(1) of the ARC. 35 Section 20(3) of the ARC. 36 The German Federal Court recently passed an interesting judgment regarding the characteriaation of retailers as small or medium-sized companies in relation to suitcase manufacturer Rimowa, see Federal Court, judgment of 12 December 2017, case KZR 50/15. 37 Section 20(3) of the ARC. 38 In 2014, the Frankfurt District Court (judgment of 18 June 2014, case 2-03 O 158/13) found that Deuter, a German manufacturer of outdoor backpacks, had a ‘powerful market position’ and therefore held a position of relative dominance pursuant Section 20(2) of the ARC, because Deuter had apparently claimed to be the ‘European leader in functional backpacks’ and had not contested the allegation of being dominant during the court proceedings. The judgment does not contain any further discussion of why Deuter was found to be dominant. Upon appeal, the Frankfurt Court of Appeals merely found that the fact that Deuter was ‘relatively dominant’ had not been disputed in the proceedings (judgment of 22 December 2015, case 11 U 84/14 (Kart). 42 See, in particular, Federal Court, decision of 11 December 2012, case KVR 7/12 – Puttgarten/German ferry terminal for further details. The case was referred back and remains pending before the Düsseldorf Court of Appeal. 43 ECJ, judgment of 16 July 2015, case C-170/13 – Huawei/ZTE. 44 The FCO in particular examined whether DB had abusively charged higher commissions to competitors than to its own subsidiaries for selling tickets. 48 In most cases, the FCO adopted commitment decisions (and in some cases, the FCO closed the proceedings without a decision, as it did not find its initial suspicions confirmed by the results of its investigations). As there were therefore no final non-commitment decisions in this case, the FCO was able to leave several legal questions ultimately open. 51 Düsseldorf Court of Appeal, decision of 18 November 2015, case VI-Kart 6/14 (V). 52 The Federal Court considered it abusive under Section 19(1) ARC if a dominant enterprise invokes terms and conditions that are invalid under civil law. Such conduct is in particular abusive if the clause in question had only been accepted because of the companies dominance, see FCJ, judgment of January 24, 2017, case KZR 47/14 – VBL Gegenwert II, paragraph 35. 53 See the FCO’s background paper on the Facebook investigation of 19 December 2017, available in German only at https://www.bundeskartellamt.de/SharedDocs/Publikation/DE/Diskussions_Hintergrundpapier/Hintergrundpapier_Facebook.pdf?__blob=publicationFile&v=5. 54 Several German commentators have severely criticised this new rule. They argue that the new rule violates the constitutional principle of fault, as a legal entity may be held liable without any culpable behaviour of its own or of its bodies. Therefore, litigation on this issue may be expected over the following years. 55 Under the old rules, liability for fines was – in principle – limited to the specific legal entity that had committed the infringement and did not extend to new legal entities resulting from corporate transformations, such as corporate mergers. This gap had been used by several companies to avoid fines through corporate restructurings. However, according to the Federal Court’s case law, a legal successor can also be held liable under the old rules (which remain applicable to conduct that occurred prior to the change in law) if – from an economic perspective – the legal successor’s assets were (nearly) identical with those of the legal entity that committed the infringement. In this context, the Düsseldorf Court of Appeal recently confirmed a fine imposed by the FCO on a German coffee roaster (judgment of 10 February 2014, case V-4 Kart 5/11 (OWi). 56 German sausage producer Tönnies had effectively used remaining legal loopholes to avoid fines for its participation in the Sausage cartel by conducting internal restructuring measures. 57 Section 81(4) of the ARC. 58 According to the previous guidelines, the FCO first determined a basic amount of the fine, taking into account the gravity as well as the duration of the infringement, and then adjusted the basic amount by a deterrence factor, reflecting aggravating and mitigating circumstances. 59 This was in particular because of a decision of the Federal Court of Justice (judgment of 26 February 2013, case KRB 20/12 – Zementkartell). The current FCO fining guidelines are available at www.bundeskartellamt.de/SharedDocs/Publikation/EN/Leitlinien/Guidelines%20for%20the%20setting%20of%20fines.pdf?__blob=publicationFile&v=3. 60 The proceedings concerned rail manufacturers, breweries, sausage manufacturers, manufacturers of concrete paving stones, providers of specialist mining services, automotive parts producers, providers of container transport services, manufacturers of prefabricated garages, and a customer allocation proceeding concerning certain services provided in power plants. 66 The FCO’s proceedings against Expedia are still ongoing. 67 There is no formal complaint procedure, though, which means notably that complainants do not have a legal remedy against a rejection of their complaint. 69 The guidance paper is available in German at www.bundeskartellamt.de/SharedDocs/Publikation/DE/Merkbl%C3%A4tter/Merkblatt-Settlement.pdf?__blob=publicationFile&v=2. In contrast to the EU settlement programme, under German law, settlements can also be concluded in cases other than those involving cartels, including dominance cases. 70 In December 2014, the EU Directive on Antitrust Damages Actions (2014/104/EU) came into effect. Member States had to implement the Directive in their national law by the end of 2016. In Germany, this Directive is being implemented by the Ninth ARC Amendment. 71 Düsseldorf District Court, judgment of 17 December 2013, case 37 O 200/09 – CDC. 72 Düsseldorf Court of Appeals, judgment of 18 February 2015, case VI U 3/14; CDC has not further appealed this decision. 73 In Germany, the court and legal fees in civil proceedings are determined based on the value of the claim. 74 Section 33b of the ARC (formerly, Section 33(4) of the ARC, changed by the Ninth ARC Amendment). 75 Munich Court of Appeals, judgment of 21 February 2013, case U 5006/11 Kart; Berlin District Court, judgment of 6 August 2013, case 16 O 193/11 Kart. 78 See above and footnote 3.